Fascism is once again on the increase throughout Europe. Anti-racism must be at the core of a fully inclusive socialism for the twenty-first century, argues Mike Cole. Mike Cole is Professor in Education at the University of East London and the author of Racism: A Critical Analysis (Pluto Press). Write to him at mike.cole2@ntlworld.com. It is a commonly held belief in the UK that racism can only be related to skin colour. However, the focus in the countdown to the last UK General Election was on forms of racism that are not (necessarily) based on skin colour. Leading theoretician at the Institute of Race Relations, Ambalavaner Sivanandan has described the racism directed at white Eastern Europeans as xeno-racism (racism in substance, but ‘xeno’ in form). While xeno-racism is non-colour-coded, that meted out to migrants, refugees and asylum-seekers may be termed ‘hybridist’ in that, given their diverse countries of origin, whether skin colour is a factor or not is not clear. 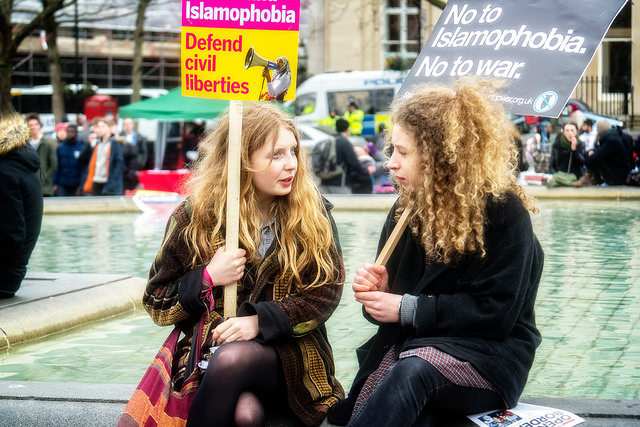 Islamophobia, which features in anti-migrant racism as well as being a major form of racism in its own right, may also be thought of as hybridist. To quote Sivananandan again, ‘the victims are marked out not so much by their colour as by their beards and headscarves’. After his election victory, David Cameron fulfilled his pledge, made in the context of challenges from the racist UK Independence Party (UKIP), for a referendum on EU membership. Following Brexit, police statistics show a sharp rise in Islamophobia and xeno-racism. As well as attacks on religious buildings, migrants from Eastern Europe have been targeted, including a student stabbed in the neck for speaking Polish, and the killing of a Polish man. Anti-Semitic assaults (anti-Semitism, of course, is a long-standing form of non-colour-coded racism) is also on the increase and has become a major talking point in UK political life. In addition to these violent attacks, a report by the European Commission against Racism and Intolerance (ECRI) found a ‘number of areas of concern’ over political discourse in the UK. In a recent article in the Independent, Lizzie Dearden cites ECRI chair Christian Ahlund who notes “it is no coincidence that racist violence is on the rise in the UK at the same time as we see worrying examples of intolerance and hate speech in the newspapers, online and even among politicians”. As Ahlund concludes, the post-Brexit violence means that the British authorities take remedial steps to remedy ‘as a matter of priority’. In a cross-party report published on 16 October, the UK Home Affairs Committee called on all political leaders to tackle the growing prevalence of antisemitism. It noted that “the failure of the Labour Party consistently to deal with antisemitic incidents in recent years risks lending force to allegations that elements of the Labour movement” are institutionally anti-Semitic, but stressed that all parties must examine whether the Committee’s recommended reforms should be applied to their own processes for training and disciplining their members and activists. However, the public prominence of xeno- and hybridist racism and anti-Semitism should not lead us to underestimate the continuing significance of colour-coded racism. On the contrary: to take one crucial measure of inequality, as the Institute of Race Relations recently pointed out, throughout the UK, people from BAME groups are much more likely to be in poverty (I.E. an income of less than 60% of the median household income) than white British people. In 2015, Pakistani and Bangladeshi communities were the most likely to be in persistent poverty, followed by Black African and Black Caribbean communities. Another measure of poverty relates to the eligibility of free school meals, with the minority ethnic group most likely to be eligible, being Bangladeshi students. Other modern manifestations of colour-coded racism can be found in some police forces, relate to mental health issues, and football matches remain a hotbed of racism. A largely ignored form of racism related to Britain’s colonial past is experienced by the UK’s Chinese communities. While the Shami Chakrabarti Inquiry found that the “Labour Party is not overrun by antisemitism, Islamophobia or other forms of racism,” it is time for pro-active fresh policy initiatives from a Left-driven (both with respect to grassroots support and leadership) Labour Party. One of its major tasks must be to explore the links between migration and racism, thereby busting the myth that an antipathy to immigration has nothing to do with racism. There is thus a need to articulate the nature of the multifarious forms of racism in the UK, including those that are not obviously colour-coded (in addition to xeno-racism and hybridist racism and anti-Semitism, this must also encompass anti-Gypsy, Roma and Traveller racism – eligibility for free school meals is higher than for students of Asian origin – and anti-Irish racism) as well as the colour-coded racism experienced by those from Britain’s ex-colonies, and to challenge all forms of racism head-on. Although I have looked here at developments in the UK, the world is self-evidently polarising between right and left, between those who cling on to the failed racialized neoliberal capital model and those who seek the alternative of a renewed socialism. Fascism is once again on the increase throughout Europe, and is a feature among a number of disillusioned Americans who favour Trump. Anti-racism must be at the core of a fully inclusive socialism for the twenty-first century. Thank you for this article. I haven’t laughed so much in ages. This is yet another despicable attempt to squeeze in the ‘racist’ slur (just like they try to paint criticism of the vile Islamistic ideology as ‘racism’). Obviously in an attempt to convince people that non-believers in their cultural marxism should be targeted with full state violence (another favorite hobby of totalitarian Marxists). This Islamophile anti-European haters makes me vomit because they have let themselves be brainwashed into being crusaders against their own kind. It is actually kind of funny that the author seems to think it is necessary to explicitly include anti-racism in socialism. Obviously he doesn’t understand his own Marxism (no need for the fig-leaf word ‘socialism’, there is nothing social about it) has always been based on the unscientific (and false) assumption that biology is not a determining factor in the difference between the sexes and races, that men instead is entirely determined by social forces. Unfortunately, because the last 500 years have proven Europeans to be superior, this false assumption has driven Marxists to constantly seek discriminatory rules against Europeans. Their ‘anti-racism’ has naturally evolved into ‘anti-white racism’ because it is the only way they can maintain their illusion that all people are only different on the outside. The Left can’t get there quick enough to defend ethnic monocluturism elsewhere in the world. Here in the West our own culture and values must be destroyed. This is self-immolation on an unprecedented scale. There is no way we can defend ourselves until we have defeated the poison of Marxism. The Left appear determined to provoke civil war. If Mr Cole is a Professor of Education heaven help his students. What a sad place we’ve got to.